A thriving gateway into the Brazilian state of Rio Grande do Norte, the city of Natal serves as the state capital, as well as being a popular coastal destination with an abundance of tempting tropical beaches and giant desert-like sand dunes. Package tourism has become a mainstay of Natal, with tourists flocking here each year to sunbathe on the beaches, go scuba diving around the nearby coral reefs of Parrachos de Maracajaú, and of course to take a beach buggy ride over the dunes and along the coastline. Although the northerly beaches of the Praia do Meio and the Praia dos Artistas still receive much attention, it is the southerly suburb of Ponta Negra that has become the biggest tourist magnet, being located around 12 km / 7 miles to the south-east of the city centre. Ponta Negra offers good surfing conditions, numerous resort hotels and an enviable nightlife, which is based around the Alto do Ponta Negra district. If you are holidaying in Natal during early December, then you will be able to join in the partying at one of Brazil's largest out-of-season carnivals. Various tourist centres (centro de turismo) are based in Natal, being operated by the Setur tourism organisation and located close to the main beaches, such as both the Praia de Ponta Negra and the Praia dos Artistas. A further tourism outlet resides on the Rua Aderbal de Figueiredo, within the easterly Petropolis neighbourhood. Natal has become a gateway to the numerous tourist attractions within Rio Grande do Norte, with many being just a short distance from the beaches. The Parque da Cidade Dom Nivaldo Monte (City Park) deserves a visit, where the contemporary landscaping really is something of a botanical masterpiece. On the outskirts of the city, the Parque das Dunas (Dunas State Ecological Park) is amongst Brazil's largest and is overflowing with native jungle wildlife, which can be observed by following the organised trails. The Natal Aquarium enjoys high visitor numbers and offers an insight into the marine creatures living close by in the South Atlantic Ocean, while for a spot of culture in the evening, the Teatro Alberto Maranhao (Alberto Maranhao Theatre) comes with a comprehensive calendar of performances and concerts. More information about Natal Tourist Attractions. Various landmarks reside in the city, with a huge collection of important colonial buildings standing within the Natal Historic Centre. Overlooking the water is the medieval Forte dos Reis Magos (Fortress of Three Wise Men), which dates back more than 400 years, with its completion being a true milestone when the city was founded at the end of 1599. Attended by almost 35,000 students, the Universidade Federal do Rio Grande do Norte (Federal University of Rio Grande do Norte) may not quite hold that level of history, but is still very much a important landmark in Natal, being regarded as one of Latin America's very best universities. Crossing the Rio Potengi (Potengi River), the Ponte Newton Navarro (Newton Navarro Bridge) is another prominent structure and was built to connect the North and South zones. More information about Natal Landmarks and Monuments. Whilst there is no denying that almost everyone comes to Natal for its sweeping sandy beaches, there are a number of local museums that might be of interest, particularly during times of inclement weather. The Museu Camara Cascudo (Museum Camara Cascudo) is one such attraction for culture vultures and features an assortment of displays and information relating to the city's history and past settlements of native Indians (Potiguares). At the Igreja Santo Antonio (Church of St. Anthony), the Museu de Arte Sacra (Museum of Sacred Art) is home to a collection of religious paintings and treasures. If you wish to learn more about local folklore and traditions, then the Museu de Cultura Popular (Museum of Popular Culture) beckons. More information about Natal Museums. There are certainly plenty of possible excursions if you choose to head outside of Natal. The Rio Grande do Norte boasts a simply spectacular coastline and has many wonderful beaches. Head to the north of Natal and you can following the coast all the way to the Praia de Zumbi, while to the south, the much-visited Praia da Pipa and adjacent Praia do Madeiro draws crowds of tourists each year, coming to sunbathe, swim, surf, party and see the friendly resident dolphins and Ecological Reserve. Additional beach resorts reside between Genipabu and Galinhos, with those furthest from Natal tending to be the quietest. Tourism has become a mainstay at the nearby resort of Touros, where stunning beaches are accompanied by Brazil's tallest lighthouse, the Farol do Calcanhar. 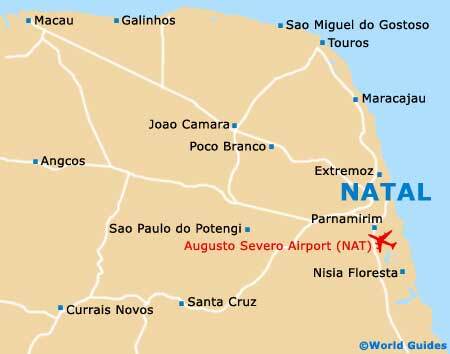 More information about Natal Attractions Nearby.